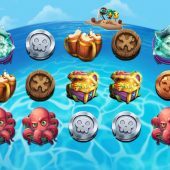 Wild Plunder slot is the second annoying pirate-themed slot I have had the misfortune to encounter very recently, the last one being Red Tiger's crashingly bad Piggy Pirates. A least I have confidence that Wild Plunder surely cannot be as bad, despite the childish appearance of the symbols which appear on transparent reels set over an ocean globe, all of which doesn't bode well for this trial. At least we are spared cartoon sea shanty music and instead get gentle taps as the reels start and stop, so will our bankroll be forced to walk the plank here? A usual formation here of 5 reels of 3 rows over which we have 25 paying lines. 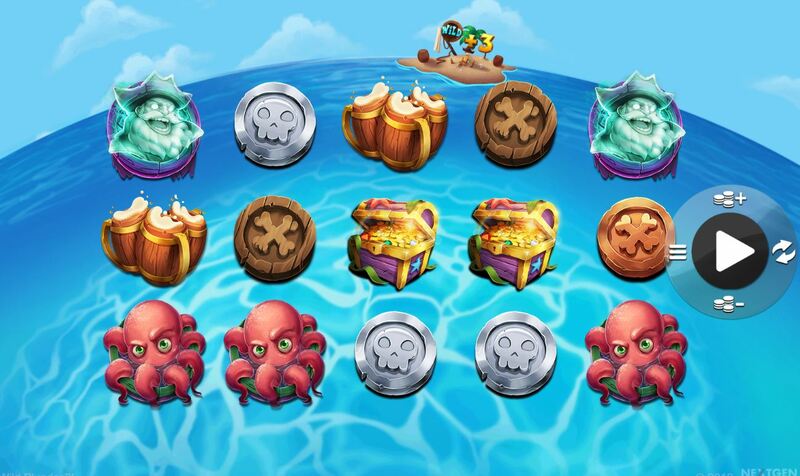 As the title suggests Wild Plunder really is all about the various Wild symbols and if we see a 5-of-a-kind of them we get a staggering 16x bet, then 14x for the gormless Pink Octopus, 12x for the Ghost Pirate, 6x for the Treasure Chests or Beer Jugs. No card values but instead there are 4 different coloured wooden tokens all paying 2x for a full line. There are no scatters but here we don't need any. When 2 or more Jolly Rhonda (help, help me Rhonda!) Pirate Wilds appear in view we will see them turn any adjacent picture symbols Wild too before pays are calculated and then they will move one position to the left. This continues until all Rhonda's have disappeared off the grid. You can trigger this randomly when just one Rhonda Wild appears and then may randomly freeze that reel while the others reels re-spin once. After any spin the sea monster (Kraken) may erupt from the ocean and turn one or more positions into a Rhonda Wild. You will have noticed islands revolving around the globe with 'Wild +3' or 'Wild +9' on them. At the start of any spin the globe behind the reels may start to rotate rapidly and an island will stop above the reels, adding it's number of Wilds to the grid, which can be 3 to 9 and they will all land on the centre 3 reels. You can't trigger any of the above features during this spin.